We are spending a lot of time outside with our warm weather. The chickens here are enjoying a drink from the fountain. My own eggs from the back yard still fascinates me. Here is one with what I think are calcium type deposits on the shell. The new chicks are in their playpen daily now and we have let them out with the big girls a few times. All have been getting along well. My hens are so sweet so I figured they would be good girls. 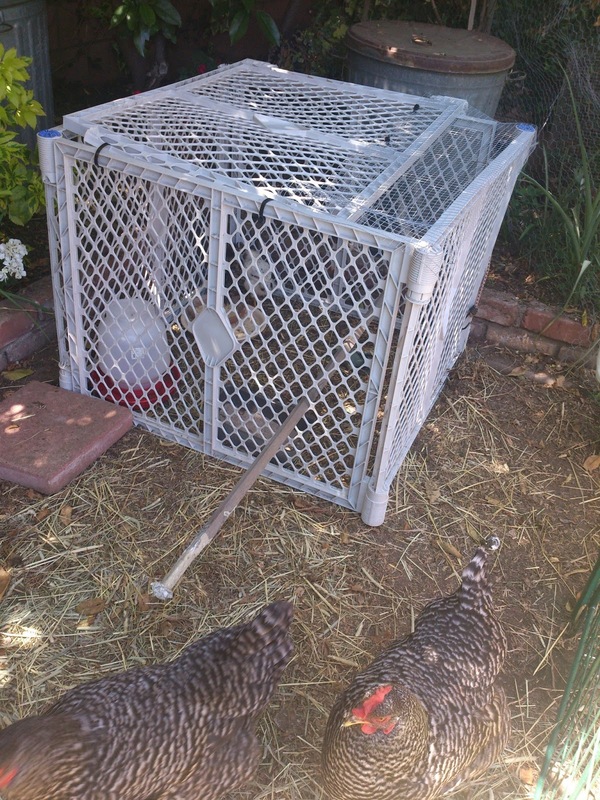 One of them will lay next to the playpen and the chicks inside will lay right next to her. Love it. 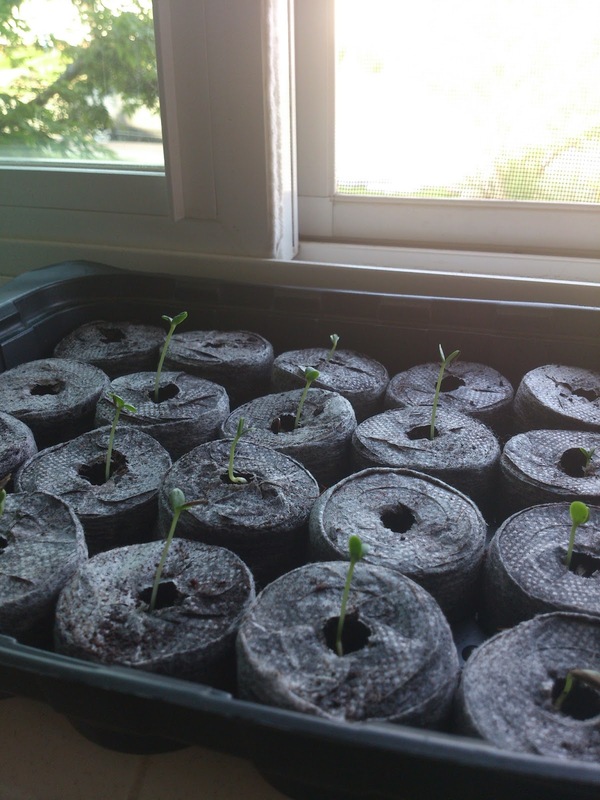 Growing zinnias and Armenian cukes in the windowsill. I never used these grow pods before. They were a gift from a friend. Pretty easy. 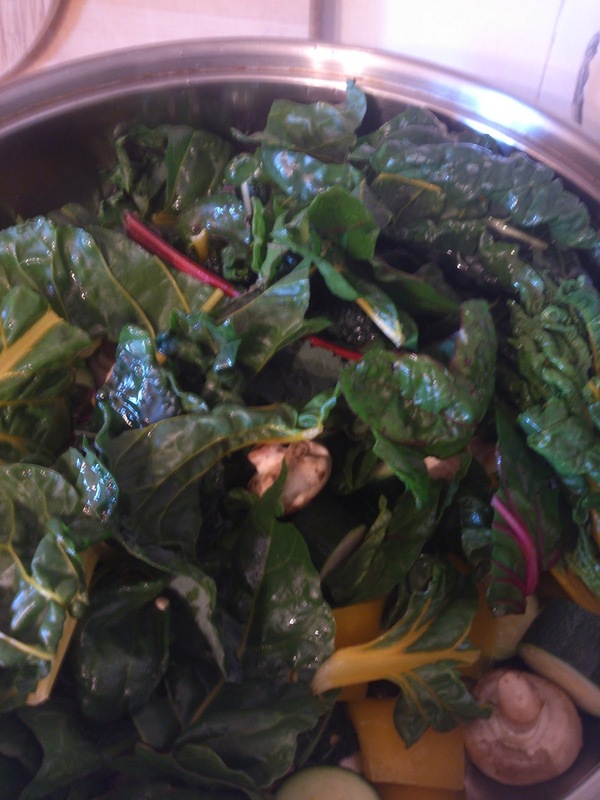 I am harvesting lots of chard as it is getting ready to bolt. I love it and do not know how I never grew this before. 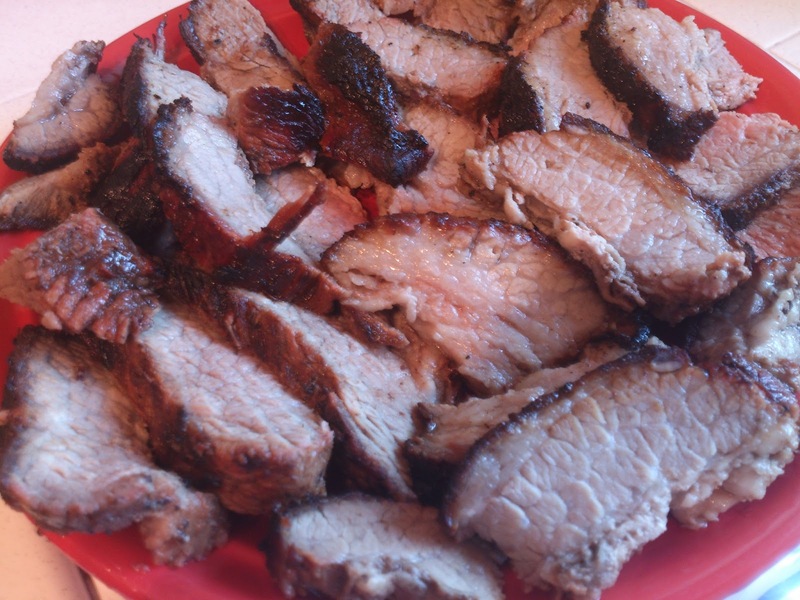 We barbecued a brisket. It was pretty good. Not the easiest piece of meat but we wanted to try one. 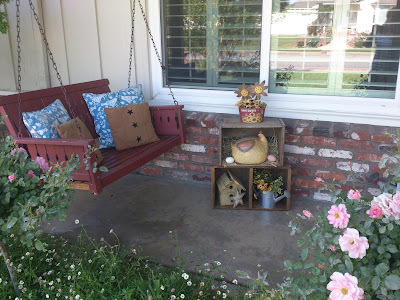 My porch is going to featured over at Cozy Little House this week so I was tweaking and sprucing it up yesterday. Here is a sneak peek but to see the whole thing you will have to visit Brenda's. Oh I love the hen sitting near the chicks and them cuddling over toward her, so sweet. Good morning! Are the chicks staying outside all night too? How are old are they now? I can't wait to my new girls feather out, and can be outside. I can barely move in my sewing room!!! Swiss Chard, eh? I have not planted it before. 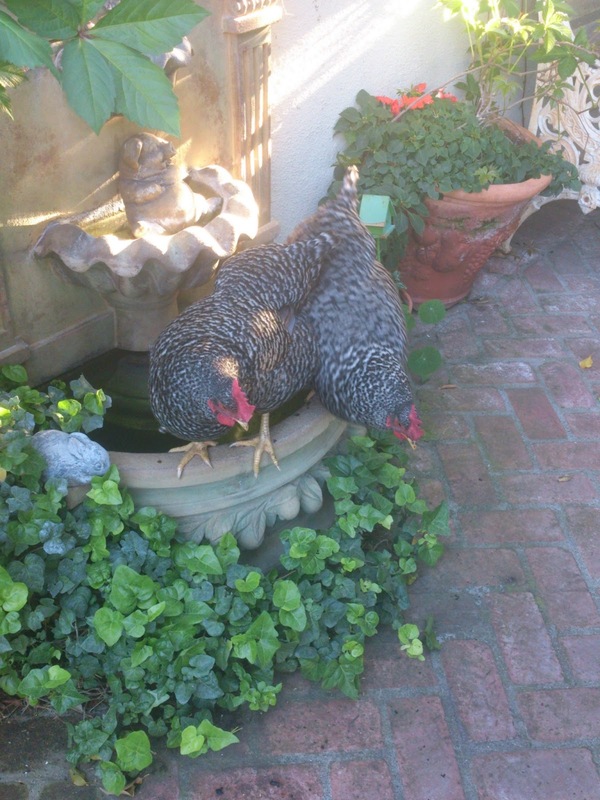 I've always wanted hens in the backyard but have always had cats and dogs. Our neighbour has hens and a rooster who has no idea of time but he is far enough away for that not to be a problem. Your brisket looks so tender and tasty...I might try cooking one.. I look forward to your spring porch at Cozy Little House. I love your chicken posts. Does the chard taste like spinach? So glad to hear the chicks and chickens are getting along. We will be putting our chicks in with the older gals soon. Can't wait to see the rest of your porch. It look lovely in the sneak peek. I'll be checking your porch out at Brenda's! 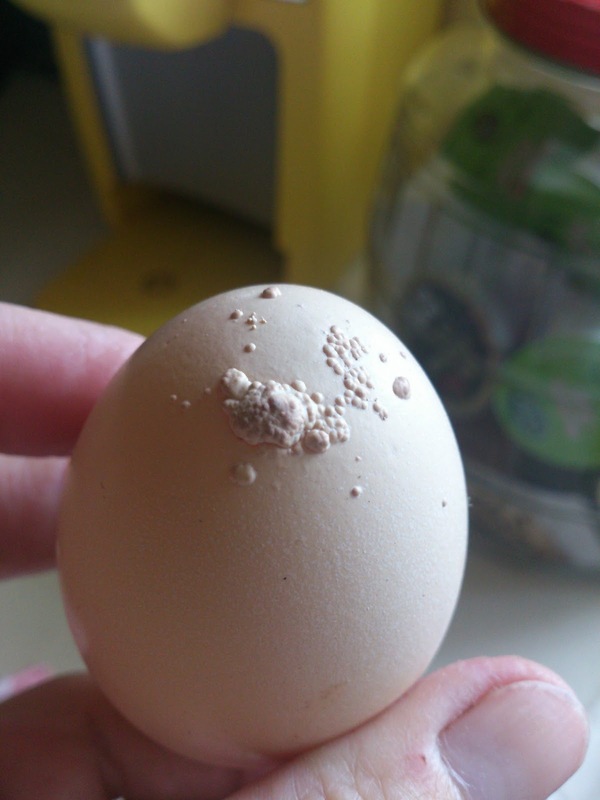 Looks like your hens need some oyster shell in their feed to solve the bumpy shell problem. If I see bumps, I know soft shells are coming next! Your chickens are so pretty. You're so lucky to have them. I miss having chickens since we moved here. I hope to have them again someday. I like your fountain. And, your porch with the swing looks like a wonderful place to hang out and relax. I love the porch. I am headed over to see the rest! and your girls are all so sweet, your transition will go so smoothly!